Last blog I described the latest humiliating collapse of the Toronto Maple Leafs, forty-seven years now without a Stanley Cup. The Leafs are the Chicago Cubs of hockey. They always find a way to not only lose, but to do so in the most disturbing manner possible. The Maple Leafs’ latest debacle can only be described as biblical – evoking as it does the Book of Exodus and its locusts, frogs, and storms of fire. I suggested that the difference between great teams and also-rans is mental. Great teams invariably have great character and leadership. Therein must lie the root causes of the Leafs demise. So what is character? What is leadership? What can the Leafs latest demise teach us? Character has spawned libraries full of books. What is good character? I’ve found no better definition than that of the great James Q. Wilson: Character entails a) self-control, and b) consideration for others. The Maple Leafs are notoriously lax defensively – fatal in a high-speed transition game like hockey where you go from offence to defence in a flash. Leafs players frequently shirk their defensive responsibilities in pursuit of ‘heroics’ – a sign of weak character? “I want to be the hero – I can’t help it! If it hurts my team, so what?” Inevitably, they get caught and it’s 1-nil. To be fair, the Leafs are a young team and young players need mentors that will help them develop character. 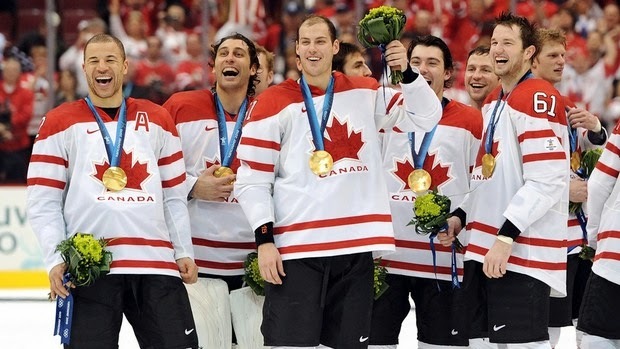 The Canadian men’s Olympic hockey team behaved in precisely the opposite manner. Coach Mike Babcock and his team of superstars emphasized the importance of ‘playing the right way’. In a tournament full of brilliant teams, this means, above all, meeting one’s defensive responsibilities. And so we saw Sydney Crosby, Jonathan Toews and other brilliant talents eschewing heroics for the common good. A team of superstars – in skill and character. On the Maple Leafs, by contrast, there are no consequences for selfish behavior. Nobody is held accountable. Leadership entails defining Purpose, communicating it tirelessly, developing a shared plan to achieve Purpose, and holding the team accountable. The Leafs current captain, Dion Phaneuf, and their prize off-season acquisition, Dave Clarkson, seem uninterested in doing so. Need we say, accountability builds character? “Derek’s always got your back,” he replied. Leadership means putting the needs of the team first. By doing so, everybody wins, including you. Is it any surprise that Derek Jeter is beloved in New York? Or that Alex Rodriguez, the anti-Jeter, is despised? Good leadership is rooted in ethics. Good ethics is good business. In summary, in my view the Maple Leafs biblical demise is rooted in weak character and poor leadership. Players seek individual glory and the big pay-off, even at the expense of the team. Team ‘leaders’ are self-interested and hold nobody accountable. Senior management lavishly rewards them. The absence of accountability holds young players back. What are the best, and worst, sports teams – and why? Who are the best, and worst, sports team leaders – and why? Though I am a suffering Dallas Cowboys fan (speaking of declines of great organizations), I have to opine that the Pittsburgh Steelers are perhaps the best sports franchise. Putting aside their record for most Super Bowl wins, they have done it with a mindset and culture that is remarkably consistent, referred to as "The Steeler Way". I have heard this references as akin to the philosophical idea of "The Ship of Theseus". The Steelers have had only 3 head coaches in the last 45 years. I hate to compare this to my own team, who current owner has either fired or hired every coach the team has ever had, and apparently has established no culture in particular. With respect to best sports leaders, I must second your mention of El Capitan, Derek Jeter. The manner in which he conducts himself, and the effect it has upon his team, is a singular example of quiet leadership by example. I tell my boys to enjoy what they have experienced seeing him play, as I doubt they will see another like him in their lifetimes. Hi Amy, Great comment -- thanks! I agree whole-heartedly about the Steelers & their 'Way'. I understand that the Rooney family are rooted in ethics & integrity, and that permeates the entire organization. I happen to be a Green Bay Packer fan, and that too, is an exemplary organization. (The most expensive ticket is 85 dollars, for heaven's sake.) As for the Cowboys, don't know Jerry Jones, but are his ethics & integrity on a par with those of the Rooney family?